Surfers Beach, Next Door to PIllar Point RV Park adds New Stairs, Sea Wall! This 90 minute action packed primetime sporting special will be airing on FOX Sports, FS1 and other FOX affiliated networks at 5pm (PST). Half Moon Bay, CA - Pillar Point RV Park - King Tide and Waves! There was lots and lots of talk and even a News 5 TV truck here at Pillar Point RV Park last weekend, predicting giant King Tide waves! Well, while over three dozen surfers waited in the water, the really BIG waves never really came. There were waves, however and everyone got a ride. Half Moon Bay, CA - Pillar Point RV Park - Grant "Twiggy" Baker wins Mavericks Surf Contest! 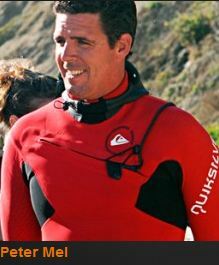 Grant "Twiggy" Baker, 40, from South Africa won the Maverick's Surf Invitational today handily beating five other finalists, Shane Dorian, Ryan Augustein, Tyler Fox, Greg Long, and Anthony Tashnick. Baker also won Mavericks in 2006. The last two days have been extraordinary here at the beach! Eighteen to twenty foot waves are pounding the coastline here and surfers are flocking to the beach by the dozens. Amazing to sit and watch the surfers do their thing. Half Moon Bay, CA - Pillar Point RV Park - Another Great Day! The wind was blowing and a bit chilly, but it made for some great waves and at least two dozen surfers were out taking advantage of the action on Surfer Beach. They were joined by windsurfers, kite surfers and some Stand Up Paddling (SUP) surfers. 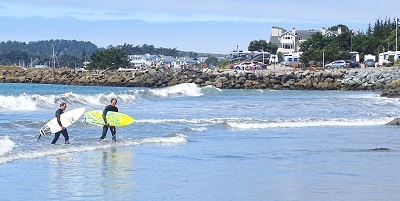 Half Moon Bay, CA - Pillar Point RV Park - Learn To Surf! 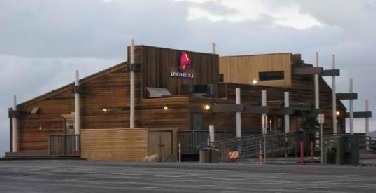 Pacifica, CA - Pillar Point RV - Taco Bell?! Taco Bell...really? Now I wouldn't have wasted my time posting about a fast food place if it wasn't incredible. I'm talking about the location and design more than I am the food, although I love Taco Bell and their food is consistant from store to store.